Throughout her career spanning decades as one of America’s most compelling and forward-thinking artists, Laurie Anderson has consistently subverted expectation through multiple mediums – poetry, film, photography, and, since 1981, music. The six albums she released on Warner Brothers are a delightfully kaleidoscopic canon of forward-thinking electronic pop – the influence of which still permeates profoundly into contemporary experimental pop: her presence can be felt from Grimes to Animal Collective and so much in-between. 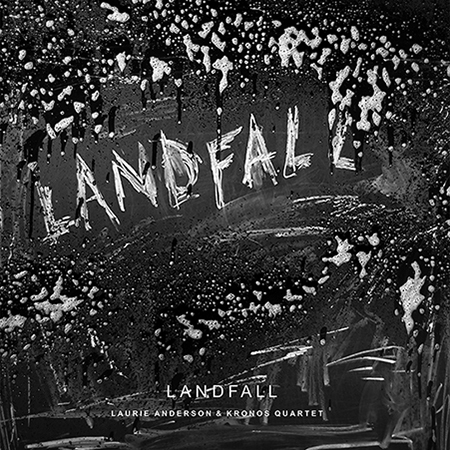 Landfall, however, has much more in common with Laurie’s soundtrack work of recent years; over thirty pieces it’s a sprawling listen. The decision to collaborate with California’s Kronos Quartet (who have similarly been perfecting their craft for decades) is an absolute masterstroke. Their lush, cinematic strings compliment Anderson’s soft, unusual electronics. All of the 30 pieces are concise vignettes that hang around just long enough to be immersive but don’t detract from the fluidity of the record. It’s a disorientating listen, with the strings veering from visceral attack to plaintiveness from movement to movement. Thematically, the work is based on Anderson’s experience of Hurricane Sandy in 2012; it’s punctuated by a narrative which Kronos Quartet interpret incisively. It contributes to an immersive and cinematic experience. There is a repetitiveness of certain pieces which contributes to a disorientating sense of dread; the storm’s violence is clearly very present in the music. The pieces are very much based on tempo changes and rhythm, representative of a storm beating down on Anderson’s native New York City while the music was written and recorded. The record is punctuated with odd, uncomfortable percussive tropes: ‘Dawn Of The World’ and ‘The Wind Lifted The Boats And’ employ the same kind of gut-tightening string techniques that coloured Tilt and The Drift. Landfall is an incredibly idiosyncratic set of recordings, but Scott Walker’s later work is probably the most suitable reference point. Thematically, this album is a great success, though perhaps not the best introduction to Anderson’s work to someone new to it. At an hour and 10 minutes, it’s a sprawling experience that requires the listener’s absolute attention to get the very best out of it. Perhaps initially abrasive, repeated listens allow the record to unfurl, displaying itself as a satisfyingly cathartic listen. Having herself experienced the ravages of Hurricane Sandy in 2012 and the loss of her husband Lou Reed in 2013, the work is in many ways a musical testament to what Anderson called a “hallucinatory” year. In terms of achieving its aims artistically, it’s a great success. I don’t think it will win Anderson or Kronos Quartet any new fans, but these are two sets of artists who have been ploughing their own furrow for decades, and have produced loads of beautiful art in the process. Landfall is a welcome and fitting addition to both artist’s canons, which in itself is very high praise. Landfall is out on 16th February through Nonesuch.